On my daughter’s mantelpiece sits a photo of her son, then aged about 3, walking along the beach with his father. Taken from behind, they are unaware of the camera’s presence. Their stance and gait are identical. Size and stature come from shared genes, the rest, the bit that matters, just happens. For Rob White, denied the chance to bond with a father he never knew, there’s a gaping hole where that bit that matters should be. 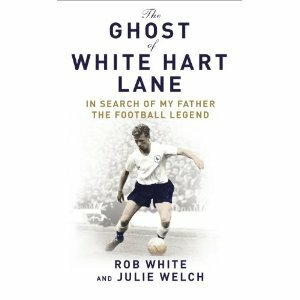 The story of his dad, John White, the former Spurs and Scotland international who rose from working class poverty to become one of the most distinctive players of his generation before dying in a tragic accident, is dramatic and fascinating in itself. Yet this is no ordinary biography. His story is interwoven with Rob’s search not just for his father’s ghost but for his own identity. years old, a Double and Cup Winners Cup behind him, the man around whom the incomparable Bill Nicholson intended to rebuild the ageing Tottenham team. The touchstone for Rob’s quest is a dusty box tucked away at the back of the loft. As a boy, he scrapes off the dirt and prepares himself for the wonders within, like an archaeologist about to enter a hitherto unknown Egyptian pyramid. Inside, he sifts through the cuttings and medals, tries on his father’s tiny boots, size six and a half. Tries to conjure up his father’s spirit. The search continues into adulthood. There’s no shortage of material as White was well liked and respected by his fellow professionals. Much is made of the camaraderie and team spirit of the Double side and he is still deeply mourned by those who knew him in the game. His close friends Cliff Jones and Dave Mackay in particular remain bewildered by his absence. Little wonder White was so popular. On the field, not only was he supremely talented, a superb passer of the ball with excellent control, he was also tireless and unstinting in his work on behalf of the team. From boyhood backstreet kickabouts to the great stadiums of Europe, you underestimated him at your peril. This small man had the heart of a lion and lungs to match, with a phenomenal workrate. He made himself constantly available for his teammates for Spurs and Scotland, ready to pick up a pass and move it on. To his opponents, they simply could not get near him. He appeared and was gone again in the blink of an eye, hence the nickname the ‘Ghost’. Despite Welch’s meticulous research and consummate storytelling, there’s a sense of never quite defining the man. Contradictions appear. Diffident in company, he was also an inveterate joker and confident in his ability. This little boy lost in the Spurs dressing room when he came to London from Falkirk in 1959 could easily delight crowds of 65,000 at the Lane, 160,000 at Hampden Park, yet each winter, after Christmas, his mood and form dipped until the spring. This may be because White, a loving father and husband and good friend to many, always held something back, a reserve shaped perhaps by self-protection at the loss of his own father at a young age and of a series of rejections in his formative years because people were unable to see beyond his small stature. However, his childhood in a caring extended family dominated by matriarchal figures instilled a powerful determination, epitomised by a ferocious desire for supreme fitness. He played football all the time, in the back yards and on the green, challenging his brothers, both of whom good good enough to play professionally, to races and keepie-uppys, delighting in the fact that he beat them every single time. Along the way there are solid gold nuggets of Spurs history. The Double, John’s rise to prominence and his growing influence is well chronicled and there’s a touching piece on Tommy Harmer, whose talent deserved more but who peaked in the mid 50s, between the great Tottenham teams of Push and Run and the Double. Blanchflower’s status and role in the club is perceptively defined, as is his decline, memorably instanced by the image of White steaming past him on a pre-season training run. As with other biographies from this era, there are frequent reminders of how much the game has changed. White played for Spurs on a weekend pass from the army as he had to complete his National Service. The players lived up the road from ground. When sacked as manager to make way for Nicholson, Jimmy Adamson had been at the club for 51 unbroken years. White’s transfer was facilitated by a Scottish journalist, Jim Rodger, who took no fee – all he wanted was the scoop. However, in other ways, at Tottenham nothing alters – Blanchflower, arguably the most influential midfielder in our post-war history, dropped for not fulfilling his defensive duties. The team criticised post-double because they were ‘only’ third or fourth. Admirably the book leaves the reader in no doubt as to White’s ability. The only modern comparison is made, surprisingly perhaps, not with a midfielder but with Dimitar Berbatov, who like White has a picture of the game in his head and can anticipate several passes ahead. In my mind’s eye, the similarity with Luka Modric is inescapable, both small but tough, tireless with superb touch and almost prescient vision. All this information and more unfolds for Rob as he grows up. The most poignant passages concern his search for connections with his father as a child. He watches the few snatches of film available of John in action, then convinces himself he runs in the same way as he studies his refection in shop windows. Mackay takes him under his wing. He’s allowed on the team coach, into the dressing room, not just to hear about White’s exploits but to experience the smells and sounds of the dressing room, the pre-match tension rising as kick-off approaches, the evocative clatter of studs on concrete as the players run out. It’s comforting for a child to have so much information about a lost father. However, this is tempered with unease and frustration as the man eludes his grasp, walking beside him through his life yet when he reaches out to touch his presence, there’s nothing there, a ghost. Rob is still searching into adulthood. He hears the stories, even sees a medium. His family are there for him, yet adulthood brings initiation into family secrets. Far from offering resolution, there is deeper mystery in the news of a half-brother from a fleeting teenage army relationship. My first Tottenham game was in 1967 so I never had the privilege of seeing White play. Talk to fans from the Double era, they laud the greats, Mackay, Blanchflower, Smith up front, then invariably turn to the best footballer of them all, ‘John White, now there was a player’, and with a gentle shake of the head, tail off into wistful silence. The least known of this team, the book is a fitting tribute to his supreme talent and should bring him the recognition he deserves. This excellent book succeeds in being both a fascinating portrayal of a fine footballer and a profound, touching insight into how our origins shape our sense of self, of interest to all fans whether they support Spurs or not. Rob’s a season ticket holder in the Park Lane now. I hope he enjoys the game and the club still. One wonders if, perhaps in the intensity of European games under lights in this venerable old ground, he catches a glimpse in the corner of his eye of the spirit of a true Tottenham great, his father. For me, there’s only one more thing to say about this book: having read it, I ache to see John White play. Just ordered a copy. Can’t wait for it to arrive. I too lost my father as a child so I can empathise with the ‘void that can never be filled’ feeling that rob must carry with him for the rest of his life. You can’t change this fact and I will be just as interested to read how rob has dealt with this just as much as look forward to reading about the great John White. I’ve been going to the lane for thirty years, had a season ticket for the last twenty, twenty very lean years. I can only dream, and read, about such glory days as the sixties. Excellent review Alan, really looking forward to reading this book. Thanks Simon, it’s well worth a read. I’m going to catch up with the Ferris book on the Double now, got it from the kids for Christmas but typically haven’t had time to read it. Hope to get the book through very soon and actually read a book on the train !. Cracking story, thanks for sharing, He inspires that sort of admiration. Received my copy yesterday…. bittersweet memories of a Spurs legend!! 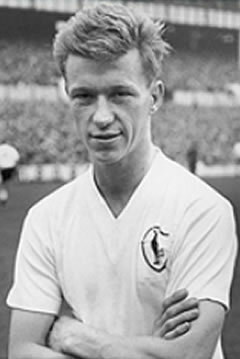 A Spurs fan since the 1950’s John White is my all-time favourite player – a genius who both created and scored goals. My first view of him was in the 13-2 win over Crewe when he was the only forward not to score and as a 9-year old with limited appreciation I over-looked his contribution. However within a year, and exiled to Nottingham I wondered at his skill as he lobbed the Forest goalie from 30-odd yards to score the first of our 4 goals. After that he seemed to feature in all that we did. The record of our only winning once when he wasn’t playing (about 15 games in 3 or 4 seasons) clearly shows what an integral part he played in our greatest ever team (so unlucky not to reach the European Cup). We were never quite the same after his death. Have read the first few pages and appreciate a great read lies ahead. Best wishes to Rob and JW’s family – he gave us great pleasure. PS Good luck to Harry and his boys tonight in Madrid – how about another 5-1 scoreline!! !